Discovering new water is always fun, and it was such a proposal that my friend Steve sent me in the form of an email a week prior to Tuesday October 7. Steve and his wife Judy own a condo in Steamboat Springs, and Steve inquired if I would be interested in accompanying him on a three day fishing trip. He proposed using his place in Steamboat as a home base, and we would fish surrounding rivers and streams. It did not take long for me to accept this enticing invitation. I responded positively, but then began experiencing the signs of a head cold on Thursday as mentioned in my last blog post. I was undeterred, however, and by Tuesday the cold was on the downside, and on a positive note, the weather continued to be unseasonably warm and dry. Steve arrived at my house at 8:30 on Tuesday morning, and we were on our way to the Colorado River at the Pumphouse access. I never fished this middle section of the Colorado River, but I read quite a few glowing reports on the quality of the fishing. Steve researched the location and the directions ahead of time, so I was in good hands as we drove west on interstate 70 to Silverthorne where we exited and continued north on route 9. After passing Green Mountain Reservoir we continued another six miles until we turned on to a packed dirt road with a sign indicating 10.5 miles to Pumphouse. The dirt road stretch was simply gorgeous as we traveled through a wide valley with sagebrush that blended into aspen trees and then evergreens on the surrounding hills. 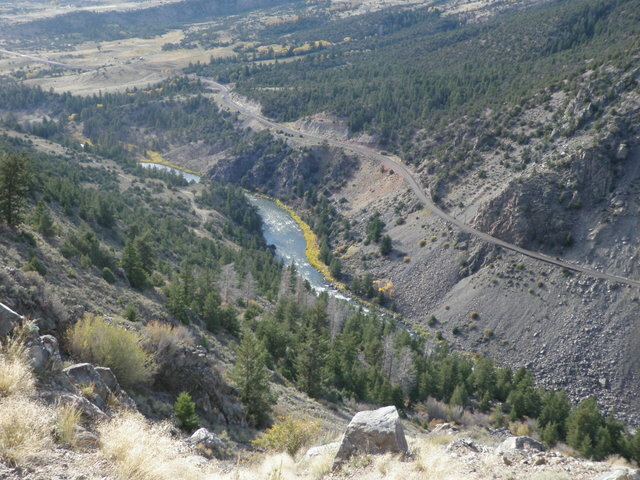 After seven miles we made a large curve to the right and descended to the rim of Gore Canyon. Another three miles, and we found ourselves turning right to the BLM Pumphouse access area which contained three boat launches, parking lots and a campground. We quickly climbed into our waders and assembled our rods, and began our quest for fish. There were two groups of three or four fishermen, and they appeared to have guides, and the groups were fishing right next to the boat ramps. Steve and I knew nothing about the hierarchy of prime locations since we were new to Pumphouse, so we began fishing in a nice pool between the two boat ramps. I chose my Scott six weight for the Grand River and began by rigging it with a strike indicator, weighted 20 incher, and beadhead hares ear and entered the water just above Launch #3. Steve waded into the edge of the river twenty yards above me and also began with two nymphs including a beadhead pheasant tail and a RS2. As we began prospecting the deep slowly flowing water, we noticed some sporadic rises in the middle of the river beyond casting range. After 15 to 20 minutes, Steve shouted that he had one and quickly landed the first fish of the day, a feisty brown trout. As he released his catch, he informed me that the pheasant tail was favored by the hungry trout, so I stripped in my line and replaced the hares ear with a salvation nymph. The air temperature was fifty degrees when we began, but with the bright sunshine overhead, the temperature quickly escalated to the upper 60’s. The only blemish on the spectacular October weather was occasional windy periods during the afternoon. I wore my raincoat as a windbreaker for the entire day, and I never felt uncomfortably warm. After converting to the salvation nymph I hooked a fish at the end of my drift as I began to lift to make another cast, but the curious fish quickly performed an escape maneuver and thwarted my efforts to land it. Steve meanwhile landed a second brown trout in the first hour at which time we both felt hungry and returned to the car where we consumed our lunches. After lunch we hiked up Gore Canyon a short distance to get above a group of fishermen who were stationed around an island just above the boat ramp that was across from the camping area. During the 1-2PM time period a fairly dense hatch of very small size 22 blue winged olives erupted. During the first half of the hatch no fish were rising, so I moved the salvation nymph to the upper fly and then added a soft hackle emerger as the bottom offering. I found a flat pointy rock that jutted into the river three or four feet and used it as a casting platform for up and across drifts of the nymphs. After quite a few passes through the deep pool, a fish bumped my fly and I set the hook. 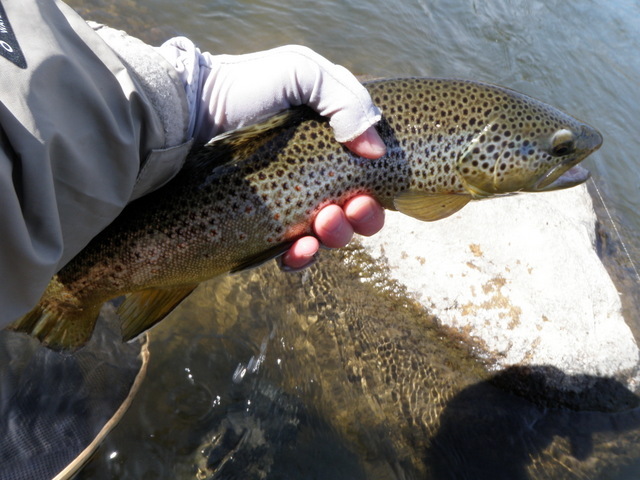 A strong battle ensued, but I finally netted a gorgeous sixteen inch brown trout with dark spots and a deep olive coloration, and the soft hackle emerger was tucked in the corner of its mouth. A photograph was in order, and then I set the muscular fighter free to fight another day. Next I continued fishing upstream in the deep pool, but my flies got wedged between some rocks, and the water was too deep to wade so I broke off the soft hackle emerger. Although the soft hackle had delivered a fine first fish, it required numerous casts in a time when a heavy hatch was evident in the air and on the water. I selected a RS2 and used it as my new point fly. I moved up along the bank a bit farther to a spot where the river gained a bit of velocity as it flowed over a submerged boulder, and in the V behind the rock I hooked and landed a thirteen inch brown on the RS2. I was encouraged by this sudden success on the previously unexplored water of the Colorado River at Pumphouse. After releasing fish number two, I gazed upstream and spotted some fish rising in a steady rhythm in the next pool. I had recent success with the nymphs, and I was reluctant to remove the split shots, indicator and two flies but after observing for a few minutes, I could not resist the allure of fishing dry flies to steady risers. As quickly as possible I removed all the nymphing paraphernalia, and tied on the smallest CDC BWO that I could find in my foam patch. Of course by the time I was finally ready to cast, the fish stopped rising. Despite this setback I managed five or six futile backhand casts and actually generated a refusal from a brown trout in the vicinity. Once again I gazed upstream to another nice deep run off to the side of a strong deep current, and again I noticed a flurry of rises from three or four fish along the current seam. The lighting at this spot was very poor with shadows extending over the water from tall trees on the bank and sun glare interspersed with the shadows. In addition I had virtually no room for a back cast. By the time I got in position to make a cast and dried the wet CDC wing, the fish once again ceased rising. Once again I did generate a refusal and actually nicked the fish on the hook set, but the dry fly fishing was proving to be quite a challenge. I was having great difficulty seeing the tiny olive in the glare and shadows and riffles, and the fish ended their surface feast. A nice stretch of riffles over moderate depth was just ahead, so I decided to return to a dry/dropper approach before opting for nymphing. I tied on a Chernobyl ant, beadhead hares ear, and soft hackle emerger and waded upstream to the tail of a huge long pool. Once again the tease began, and I saw a few regularly rising fish. I was committed to the dry/dropper now, so I executed a backhand roll cast of the three flies above the closest rise, and on the third drift the Chernobyl paused, and I set the hook and landed a twelve inch brown on the hares ear. Shortly after releasing this fish, I roll cast farther upstream and more toward the left, and this resulted in a second twelve inch brown once again on the hares ear. Perhaps I had solved the puzzle. One more fish continued to rise farther above the spot of the last catch, but I tangled my line around the rod and by the time I resumed, the rising ended. I now found myself prospecting in big water with no rises or signs of fish to give their position away, and this proved fruitless. Steve walked back downstream to meet me, and we decided to quit at 3:15PM, but before doing so, we both agreed to hike up the trail to check out a place where the river appeared to merge after splitting around a large island. We were scouting for future reference. When we arrived at the merge point, there was a large foam pool bordered by multiple eddies, and it was one of the fishiest places I had ever seen. I could not resist the urge to make some casts, and Steve encouraged me to give it a try. I began casting to the top of a riffle where the current from the small south channel ran into the larger main river. After five or six casts I allowed the Chernobyl to drift deep into the nook of the merging currents right next to the foam, and I thought the Chernobyl disappeared. I raised the rod tip to bring the foam fly into view, and suddenly I felt weight. I accelerated the lift into a hook set, but after the momentary weight, the fish was gone. Judging from the type of water I was in, this may have been the best fish of the day, but I’ll never know. With that disappointment we hiked back on the Gore Canyon Trail to the parking lot and returned our gear to the back of Steve’s car. Next we were on our way to Steamboat Springs, but we both saw enough of the Colorado River at Pumphouse to commit to a future trip. 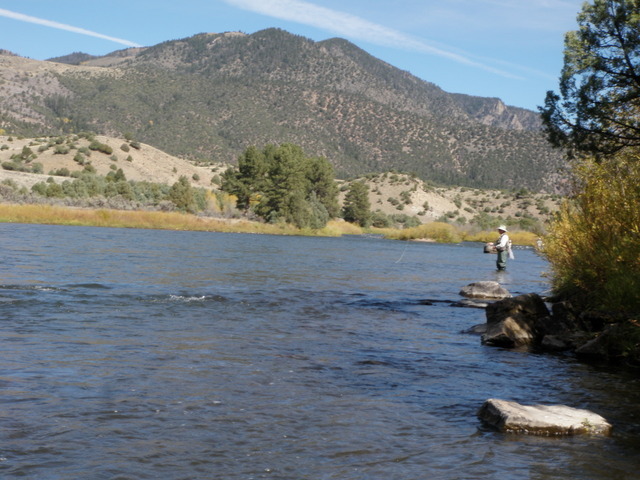 This entry was posted in Colorado River, Fishing Reports by wellerfish. Bookmark the permalink.